For those who might not yet be familiar with Kickstarter, this is a U.S. based funding platform for creative projects launched on April 2009 and working on the principle of crowdfunding : people (“backers”) can pledge to fund a project from a minimum of $1 up to $10.000 or even more. During three years of activity more than 2.5 million people from all over the world have pledged to help fund a (U.S. based) project in one of the 13 categories established  and over $350 million has been invested through the platform. When someone submits a project, he/she still remains as the owner and is in complete control of the same. If the project gets the needed amount of funding, the backers’ credit cards are charged; if not, nothing happens: it’s a “all-or-nothing” deal. And who are these “backers”? According to Kickstarter  they’re people who are inspired by ideas and want to see them being realized, people who want to receive a copy of what’s being made or simply want to support their friends. With such premises, there is the potential risk of enticing participants with a “not-so-high” level of commitment. Kickstarter has drawn up the legal documents to try to prevent this from happening for a great deal. However funding is always based on good faith and the platform does encourage a healthy level of skepticism from the investors. 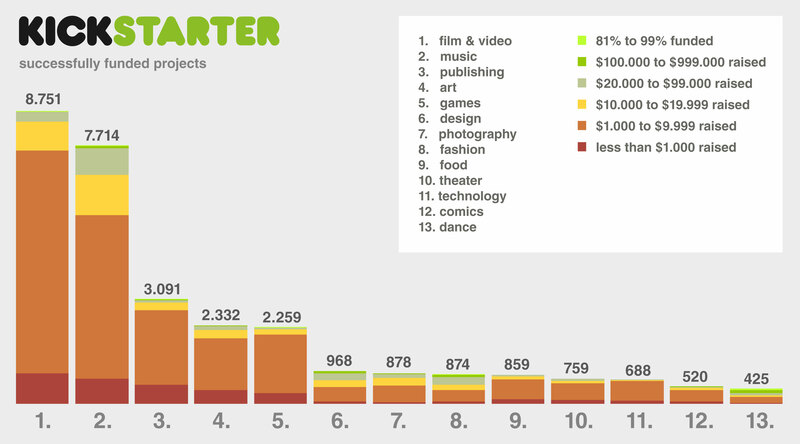 Just three months ago, Kickstarter began publishing statistics on its crowdfunding activities allowing a more detailed insight over the general numbers and the trends per category. The cumulative data is updated daily so the analysis below is based on the statistics published on the last week of September 2012. If one would consider 2010 as being the first full year of activity for the platform, then the number of projects has already tripled since then, while the investment from backers has raised above 800%. And there are still three months to go until the end of 2012. 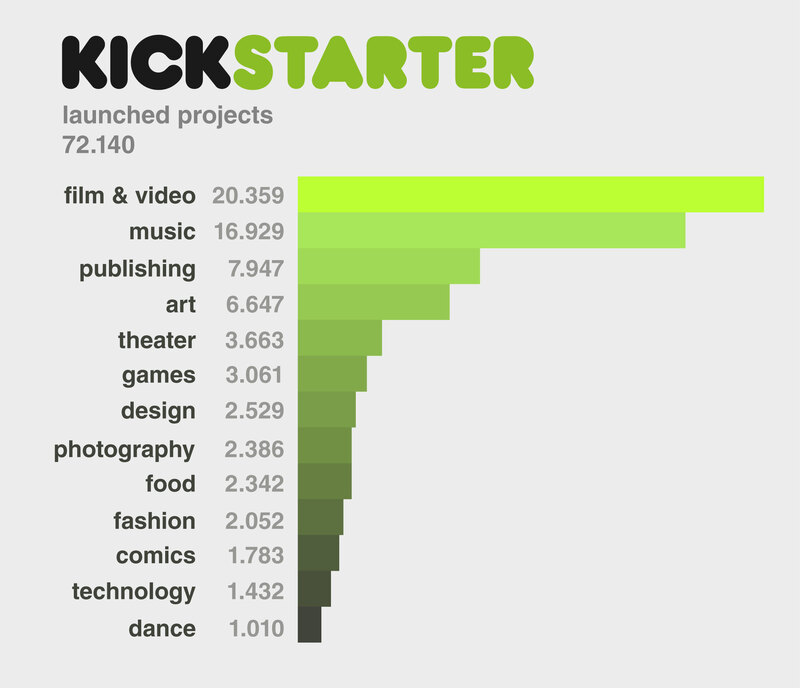 Within the 13 categories established in Kickstarter, the most popular, in terms of volume of projects and investment, are Film & Video and Music. This fact doesn’t necessarily imply that these areas are most fruitful ones: the numbers show that the success is much higher in categories such as Dance and Theater. One of the possible explanations is that the initiatives in the latter categories require low to moderate funding making them more likely to reach the 100% goal. Leading the list of categories requiring more dollars per project are Design and Games followed then by Technology (which ironically has one of the lowest success rates). In 2011 these were also the areas gathering a higher number of backers per project. The split between successful and unsuccessful projects doesn’t necessarily reflect an optimistic view: 56% of the total initiatives do not gather the requested funding. When looking into the values regarding the unsuccessful projects, it becomes clear that it is not a “close call” for the vast majority: one fifth of the projects collect no funds whatsoever and 61% manage to collect only up to 20% of the initially pledged value. Overall, 94% of the unsuccessful projects receive less than half of their financial goal. Diving into the numbers for the successful projects, it is impressive to notice that, up to now, 12 projects managed to collect more than one million dollars and half of these were games. However, projects that go beyond 100 thousand dollars represent less than 1% among the number of fortunate initiatives (what is not clearly referred is how much they represent in terms of overall investment). Most entrepreneurs hold less ambitious (and possibly more realistic) goals: 68% of the projects request an aid between one thousand and 10 thousand dollars. Up to that monetary range, the top three categories are invariably Music, Film & Video and Art. In the heavy weight league above 100 thousand dollars, Games and Design become the main players representing more than 50% of the total initiatives. 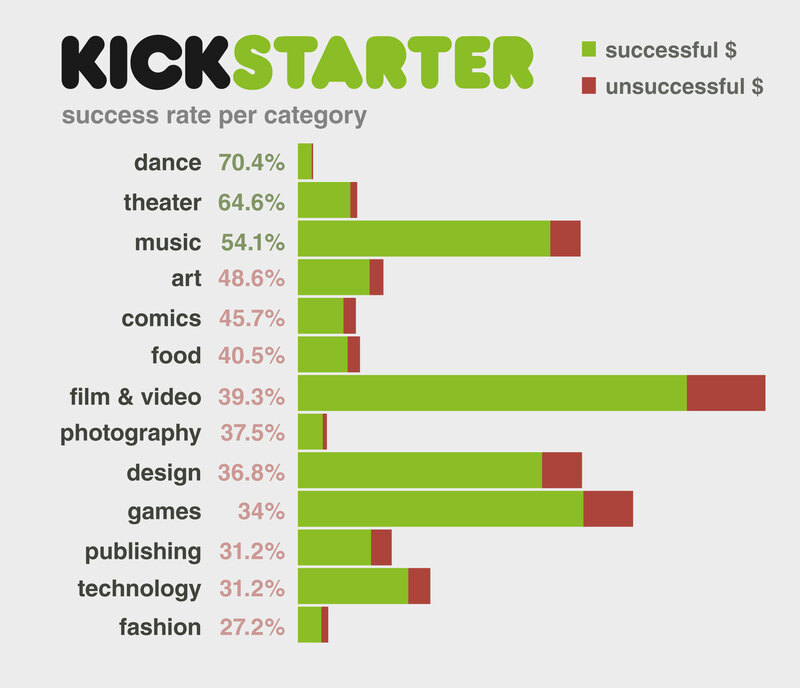 Even if the numbers for the “successful dollars”  seem smashing proportionally to the unsuccessful ones, they do not represent the number of initiatives actually accomplished – many creators fail to deliver according to their initial proposal within the set deadline which, consequently, has drawn some criticism to the platform itself. Considering the hype around the crowdfunding concept, the exponential and rapid growth of its supporting platforms  and the astonishing success of some of the initiatives launched by Kickstarter (several projects have exponentially surpassed their pledged value and it’s not uncommon to find others funded above 100%), we wonder to which extent this type of platform is not being progressively used as a promotional vehicle for new products and services. Several media publications focused on innovation regularly harvest material from these creative incubators providing some of the projects with an additional layer of credibility and extended visibility. Will this by-product of success compromise the initial intention of the venture and make the “common backer” more skeptical (also taking into account the number of projects not delivered)? And will the focus shift from small scale projects to large ventures requiring substantial capital? Will the embracing and participatory concept of crowdfunding be gradually replaced by an elitist notion of “angel-investor-funding”? Note: the graphics presented in this article were self-produced based on the statistics (daily updated stats + 2010/11 data) published by Kickstarter. Crowdfunding is based on the principal of assembling a group of individuals and bundling their resources, being their efforts, their time, their money or their network. Instead of asking a few angel investors for a large amount of money, crowdfunding is based on the idea of gathering the needed amount of funds through a network, by reaching out to a large amount of individuals. 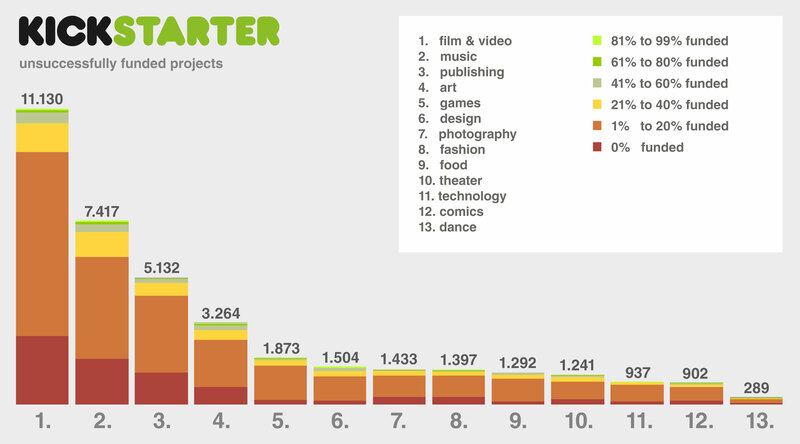 There are thirteen categories for Kickstarter projects: Art, Comics, Dance, Design, Fashion, Film, Food, Games, Music, Photography, Publishing, Technology, and Theater. Besides the guidance provided by the Kickstarter School initiative, entrepreneurs who are just giving the first steps into crowdfunding can now also count with the advice of some of Kickstarter’s first stars. Alongside Kickstarter, Indiegogo is one of the most popular crowdfunding platforms with the difference that it is not restricted to U.S. based projects – it supports initiatives from all over the world.